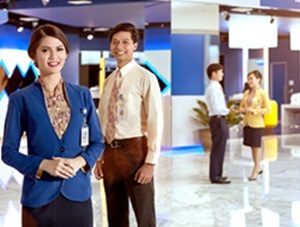 PT Bank Central Asia Tbk - BCA or referred to as "Bank BCA" is a leargest privately-owned commercial banks in Indonesia. The Bank was first established in 1955 in Semarang and initially registered as NV Perseroan Dagang Dan Industrie Semarang Knitting Factory. Later in 1957, the Company relocated its head office to Jakarta. In 1975, the Company changed its name to PT Bank Central Asia. In 2000, the Company went public and conducted its initial public offering (IPO) on the Indonesia Stock Exchange (IDX). Bank BCA's shares are traded under stock code BBCA. As of December 2016, 47.15% of its shares are held by PT Dwimuria Investama Andalan, and 52.85% remaining shares by investor and public shareholders. Headquartered in Jakarta, Bank BCA runs its business through 1,182 outlets and 17,081 proprietary ATMs spread across Indonesia. Bank BCA also supported by 7 key subsidiary companies; PT BCA Finance, BCA Finance Limited, PT Bank BCA Syariah, PT BCA Sekuritas, PT Asuransi Umum BCA, PT Central Sentosa Finance and PT Asuransi Jiwa BCA. In 2016, PT Bank Central Asia Tbk keeps growing with sustainable performance. According to PT Bank Central Asia Tbk Annual Report 2016 as cited by JobsCDC.com, Bank BCA registered total assets of Rp 676.73 trillion and maintains total third party funds of Rp 530.13 trillion in the end of 2016. Referring to its annual report, Bank BCA posted total net profit of Rp 20,606 billion in 2016. This number is reflected an 14.25% increase from Rp 18,019 billion in 2015. Have a good analytical thinking. Have a desire to excel. Not married and willing not to get married during the training period. Placement at Branch Offices BCA (Jakarta, Bandung, Purwokerto, Semarang, Kudus, Surabaya, Bangkalan, Jombang, Denpasar, Jayapura, Medan, Batam, Pekanbaru, Lampung, Jambi, Palembang, Pangkal Pinang, Malang, Tulungagung, Jember, Kediri, Banyuwangi , Jember, Blitar, Pontianak, Samarinda). JobsCDC.com now available on android device. Download now on Google Play here. Please be aware of recruitment fraud. The entire stage of this selection process is free of charge. PT Bank Central Asia Tbk - Fresh Graduate Account Officer Program BCA January 2018 will never ask for fees or upfront payments for any purposes during the recruitment process such as transportation and accommodation.